Summary: Here is some basic background information for first-time contact lens users. Wearing contact lenses for the first time shouldn’t be a terrifying event. Here are a bunch of tips for first-time users so you can ditch the glasses and make the switch to contacts. 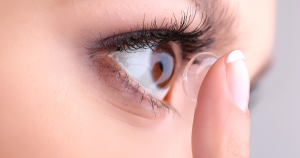 Now, when you first hear about contacts, you might hear about the horror stories about them getting stuck in the eye or harboring an immense amount of dangerous bacteria. Well, throw away all those misconceptions and stories because they’re mostly due to either poor hygiene or just laziness. The first thing you’ll want to do is check your prescription. Find an optometrist you trust, or talk to your current eye doctor about swapping out your frames for contacts. After he or she gives you the okay, you’ll likely be given instructions on how to safely put in your lenses and care for them. They might even run you through a couple tries for yourself before sending you on your way so you get a good feel on how to put them on. As stated before, if you don’t want to suffer from any eye infections or unexpected pain, always make sure you clean your hands before putting them in your eyes. You’ll also want to make sure your case is emptied of all its liquid contents before placing your old lenses back in. Trust brands like Lens.com when you purchase your contacts so you know you’re not getting fakes that will only cause you long-term issues. Also, it’s important to let your eyes breathe on occasion. Wearing them the entire day might be convenient but it’s also worth noting that taking them out every once in a while in favor of your glasses can help you avoid dry and irritated eyes.